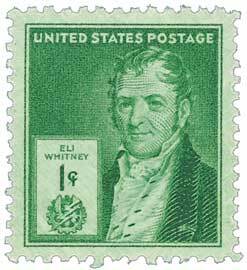 Honored on U.S. #889, Eli Whitney’s cotton gin helped shape the 19th century economy of the American South. He also developed the concept of “interchangeable parts,” which allowed for mass production, instead of making them one at a time. First used to mass-produce muskets for the U.S. Army, Whitney’s principles are often credited as the basis for the American system of manufacturing.